Marc Jacobs enters the world of color cosmetics with a new beauty brand and collaboration with Sephora. The first product tried and tested: Marc Jacobs Beauty Highliner – Gel Crayon – crazy good. Ro (Cocoa) is the perfect bronze eyeliner. Not too shimmery, this color defines and enhances the eye. The Highliner is waterproof, long-wearing and richly pigmented. The formula applies like a gel pot but with the precision of a pencil. Super-malleable, this eyeliner glides on smoothly then sets in place for all-day wear. A built-in sharpener makes sure the crayon always has a perfect point for an instantly sharp look on the go. A true breakthrough product that provides easy application with intense color. Maybelline’s Color Tatoos are a fantastic drugstore find. These cream eyeshadows last just as long as any other more expensive version and are just as vibrant and pigmented. Constantly creating new colors and finishes, my current favorite is Maybelline Color Tattoo Metal in Barely Branded. Barely Branded is a warm champagne tone with a metallic/frosted finish. A great dupe/alternative to MAC Bare Study Paint Pot (one of my favorites). A very versatile shade, Barely Branded can be warn on it’s own or as a base to brighten and make shadow stay-put. It has a wonderful creamy consistency that is great for quick and easy application and does not crease or fade, hour after hour. For a great basic cream shadow that is easily accesible and inexpensive try Maybelline Color Tattoo Metal in Barely Branded. IT Cosmetics Brow Power Universal Eyebrow Pencil is no ordinary pencil. This ultra-fine, high-definition, long-wearing, automatic eyebrow pencil adjusts to your specific brow color and supports healthy hair growth. The super-skinny tip draws the tiniest of lines, allowing you to easily mimic the look of natural brow hairs. The spooly-end brushes and polishes the brows, perfecting the look. How can one pencil be universally flattering? By using softer strokes to match lighter hair, including blonde and silver and pressing a bit harder for darker hair, including medium brown to black. The crayon-like texture goes on very lightly, so you can layer for the particular look you are going for – whether it’s natural or a bold “statement” brow. The formula is smudge-proof, waterproof and filled with good-for-you ingredients like panthenol, Vitamins A, C, and E. It also contains GrowLuxe technology, which is formulated with Saw Palmetto, Nettle Flower Extract, Horsetail Flower Extract, Green Tea Extract and Grapeseed Extract – promoting healthy hair growth. The American Cancer Society approved Brow Power as being safe for ultra-sensitive skin; this plus the GrowLuxe formula makes this pencil perfect for those who have lost their brows due to chemotherapy. In fact, for every Brow Power pencil sold, IT Cosmetics donates one pencil to the Look Good, Feel Better Program which helps women with cancer regain their confidence in their physical appearance. When running water isn’t available, cleansing wipes are something of a lifesaver during festival season. Use on both face and body when needed. Neutrogena Oil-Free Cleansing Wipes will fight bacteria and decongest the skin. Cool-off with Mario Badescu Facial Spray with Aloe, Herbs and Rosewater. Spray anywhere at anytime to hydrate the skin, tone the skin, set makeup or for a quick refresh. After prolonged sun exposure, skin needs more nourishment than ever. That is why I love Aveeno Protect + Hydrate. It feels like a body lotion but has high SPF. Protecting your skin from the sun is more important than ever at festivals since shade is often hard to find – so is protecting your lips. Shiseido Sun Protection Lip Treatment has SPF 36, feels great on the lips and looks super glossy. Look instantly glowing while protecting and treating the skin with Boscia BB Cream Bronze. This one-step wonder creates a lustrous, flawless finish as it hydrates, firms, and soothes the skin. It contains broad-spectrum SPF 27 PA++ and helps diminish the appearance of pores, fine lines, and uneven skin tone while providing long-wearing, natural coverage that conceals imperfections. Boscia’s BB Cream Bronze creates a sun-kissed complexion with just a hint of shimmer. Continuing the rant on sun protection – ColoreScience Sunforgettable Mineral Sunscreen Brush is my go-to powder. 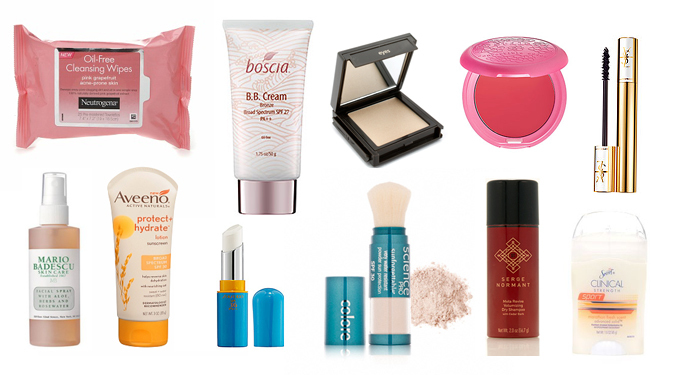 Cream sunscreen is impossible to reapply all-day – especially when wearing makeup. Use the built-in brush to apply as needed with no caking, residue and/or irritation. Pack products that are finger-friendly – like cream blush/lip pots and eyeshadows. Festivals are a great time to experiment with color. Stila Convertable Color in Sweet Pea is the perfect pop of color for both cheeks and lips. It creates a dewy complexion and pouty lips. Find cream eyeshadows that are long-lasting and won’t crease. I love Jouer Creme Eyeshadow in Chiffon. It creates the most amazing shine on the eye that almost looks wet and stays-put all day. This is also a great product to have handy because it moonlights as a highlighter. Though I loathe waterproof mascara – it is a must in situations like these. YSL Singulier Nuit Blanche is a great mascara and not too impossible to take-off. It will not run or smudge and the brush is amazing. No festival beauty guide would be complete without a highly-effective and much-loved Dry Shampoo. Serge Normant Meta Revive Dry Shampoo not only does a great job to rid your hair of oils – but is an amazing styling product. It will give your hair extra volume without feeling sticky or stiff. Speaking of sticky – don’t be the smelly kid in the group and pack your Secret Clinical Strength Deodorant. Have fun – Be safe – Stay hydrated! Waterproof when you want it to be. Anastasia Beverly Hills Lash Genius instantly waterproofs, refreshes, and protects any mascara all day, without the typical drying or clumping. It’s advanced, lightweight formula glides on smooth, dries quickly, and gives your lashes a glossy lacquer finish that lasts all day. Feel un-phased in the face of a downpour or smug at your best friend’s wedding, Lash Genius will protect you. Lash Genius comes in a typical mascara-type tube with short, stiff bristles. The formula is a slightly milky-colored gel that feels a bit tacky to the touch. It applies beautifully with a slightly wet texture that instantly adds shine and gloss to the lashes. Lash Genius is fragrance, paraben, and cruelty free. Never decide on which formula to purchase of your favorite mascara again. I never seem to buy waterproof mascara. The formula, on me, feels thicker and heavier and it is a pain to remove. Don’t get me wrong, Lash Genius is a pain to remove, however, it does the job of a waterproof formula (better) and lash lacquer – all-in-one. So… it’s worth it. NARS Eyeshadow Duos are long-wearing and crease-resistant. They are beautifully pigmented and creamy to the touch. The Duos are available in a myriad of colors and textures and are always interestingly and uniquely paired. While scouring NARS Eyeshadows, it is easy to focus primarily on the unusual bright colors. The neutral duos have a hard time competing. NARS Eyeshadow Duo in Kalahari is a great neutral option. It contains two very wearable color combinations, a shimmering bronze with peach undertones and a warm brown with taupe undertones. Kalahari is available in NARS’ permanent collection. Worn together or alone, these shades are richly pigmented and can be applied sheer or built-up for a more dramatic effect. Used wet, these shadows also double as eyeliners. Kalahari will flatter any eye color. The warm tones look amazing on dark and light skin tone and will reflect beautifully in the summer sun. Curiosity was the culprit to testing Bare Escentuals Magic Wand Brushless Mascara. According to Bare Escentuals, their mascara claims to coat the lashes, one by one, to achieve the look of false lashes. The unique design of the brushless wand has tiny ridges etched-in to capture each individual lash. The formula is pitch black with a satin finish, long-wearing and no flakes. Application is where there is a learning curve. Technique and patience are strongly advised. Clumpy spider lashes will be the outcome of the preliminary trials. Revert back to directions which specifically state to use soft and slow strokes. Lashes will still clump together but notice the ridiculous length. Using a lash comb (Favorite: Tweezerman Metal Lash Comb) separate the lashes and finally you have applied one coat of mascara. Add second coat if needed. To be honest, this is a great mascara. To be frank, do you really want to spend twenty minutes applying mascara? With party season around the corner, every girl needs a powerful lip color in their arsenal. The Super-Saturated High Gloss Lip Color’s by Urban Decay deliver high-impact color with a punch. Like having a lipstick and lip gloss in one, these chubby pencils provide vibrant, rich color with a glossy finish. The product is long-wearing, and the opaque color continuously looks presentable without feathering. The Lip Color’s are super creamy, hydrating and convertible. Currently available in five shades: F-Bomb (bright red cream), Punch Drunk (bright orange cream), Adrenaline (bright fuchsia sparkle), Crush (hot pink), and Big Bang (bright pink with sparkle). Of all the shades, I am currently loving F-Bomb and Crush, the creamier versions. The sparkle shades feel a little gritty on the lips and are a bit troublesome with application. All-in-all, the Super-Saturated High Gloss Lip Color’s by Urban Decay are a great lip product to have on-hand during party season. Gel-based eyeliners provide the look of liquid-liner but apply with the ease and control of a gel formula. Bobbi Brown Long-Wear Gel Eyeliners are my pick in this category. They are extremely pliable, long-wearing, water-resistant and are available in an array of 14 beautiful colors. This award-winning liner feels light and silky on the skin. The texture is smooth, slippery and glides on the eyelid gracefully. This liner lasts all day, no flaking and stays put. Like most gel-liners, packaging comes in a pot-form. This product does not dry-out as fast as others and will last a very long time because only the tiniest amount is needed. Use with any brush that you are most comfortable with. I prefer Chanel’s Pinceau 13 ultra fine eyeliner brush, it provides ultimate control and accuracy. This product is truly in a league-of-its-own and once you have tried this eyeliner, it will seem very hard to use anything else. Stila Forever Your Curl Mascara is the brand’s newest launch. This long-wearing mascara promises to instantly curl and lengthen lashes. 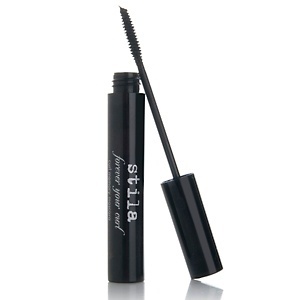 Stila’s innovative lash-curl memory is formulated to “perm” the lashes over time. The mascara’s wand is long and controlled. The brush is small and thin enabling it to coat and extend each lash, from base to tip. Eliminating the need for an eye-lash curler, this formula ultimately curls and conditions. Perms are back with Stila Forever Your Curl Mascara.